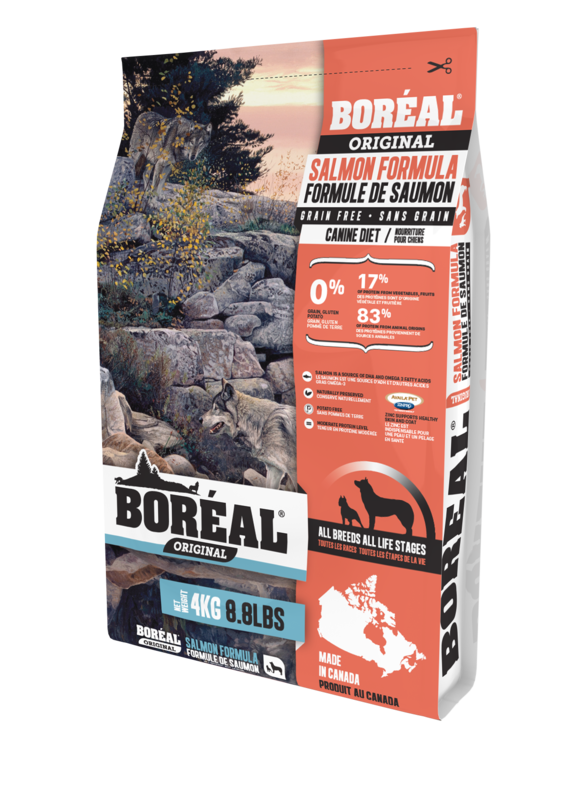 Our Boreal Original Salmon diet is a grain-free dog food using salmon as a new source of unique protein. Our Original Salmon diet uses fresh meat and meat meal as sources of protein. 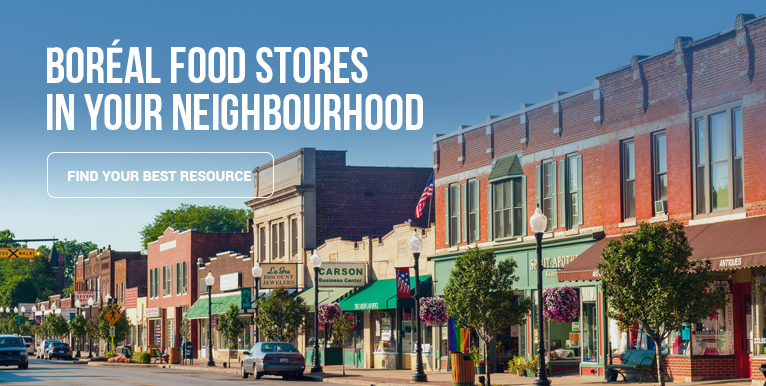 We use Atlantic salmon caught as well as Atlantic salmon raised on Canadian farms. It is a daily diet that can be used to maintain the weight of your dog and can also be used as a hypoallergenic preparation. We use a base of beans and peas to replace the grains found in many dog ​​foods, and we also add a combination of herbal pack including blueberries and cranberries, thereby improving the taste of food as well add antioxidants with several health benefits. 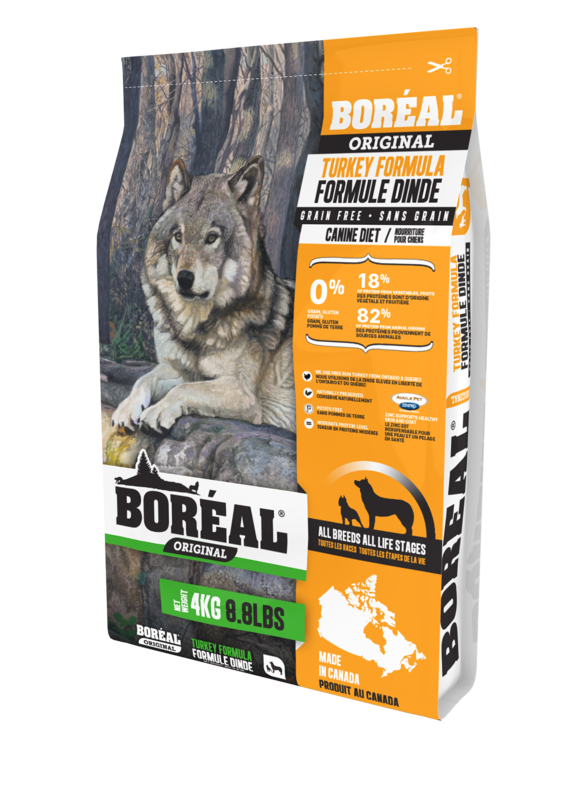 Our Boreal dog foods also contain organic zinc Availa®Zn. Availa® Zn is easily absorbed and is much more accessible to a dog than other sources of zinc. Zinc is essential for healthy skin and coat. Bags of 25 lb (11,3 kg) and 8,8 lb (3,99 kg). Salmon, Salmon Meal, Peas, Pea Starch, Canola Oil (preserved with mixed tocopherols), Dried Northern Beans, Dehydrated Alfalfa Meal, Natural Salmon Flavour, Salt, Vitamin E Supplement, Choline Chloride, DL- Methionine, Taurine, Zinc Amino Acid Complex, Iron Amino Acid Complex, Manganese Amino Acid Complex, Lecithin, Mannanoligosaccharides, Chicory Root Extract, Apple, Carrot, Cranberry, Spinach, Tomato, Calcium Carbonate, Zinc Sulfate, Ferrous Sulfate, Papaya, Pineapple Stems, Aspergillus Oryzae Fermentation Extract, Blueberries, Cranberries, Green Tea Extract, Copper Sulfate, Manganese Sulfate, Niacin, Calcium Pantothenate, Vitamin A Supplement, Riboflavin, Vitamin B12 Supplement, Thiamine Mononitrate, Sodium Selenite, Calcium Iodate, Pyridoxine Hydrochloride, Vitamin D3 Supplement, Folic Acid. To create our typical analysis information we use ingredient data from recent lab analyses along with expected vales from the ingredients database. This chart will give more information than you would see in our guaranteed analysis, but is not intended to represent absolute values.